Home › News › No Tricks Just Treats! Halloween is a holiday centered on indulgence. Overindulgence, that is: in buckets, literal buckets filled with sugar, just tempting your kids to ruin their dinner. Surely, adults wouldn’t be tempted by something so glaringly unhealthy, right? Let’s not kid ourselves, we’ve all helped ourselves to (perhaps more than) our fair share of Halloween candy. Sure, most neighbors aren’t handing out king-size Hershey’s bars, but that doesn’t mean that an entire bucket of miniatures isn’t equally tempting. Luckily, there are smart ways to indulge in the trick or treating bounty without sabotaging your diet. Remember, as with any type of sugar, portion size is key: it’s easy to blow through three or four mini bars without stopping to really taste them. Always check nutritional labels, and take the time to enjoy your treat. Savor the texture, taste, scent, and nostalgia of your traditional halloween goodies, or get creative and find a new way to enjoy some old favorites. We’ve included a few recipes below. In this case, you can have your treat and eat it too: the following treats all clocks in at 150 calories or less. Pumpkin Steamer: Heat 1 package Healthsmart Vanilla Cappuccino mix. Top with ¼ cup sugar-free Reddi-whip and pumpkin pie seasoning. 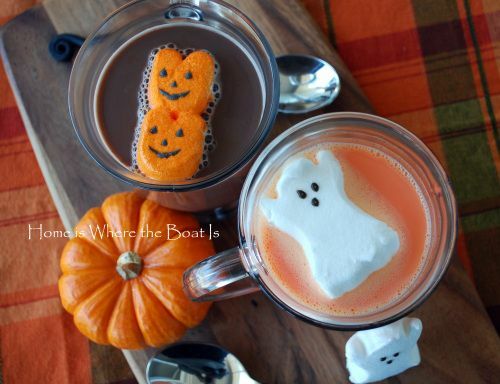 Spooky Dark Cocoa: Heat 1 package Healthsmart Hot Chocolate mix. Top with 2 Peep’s Pumpkin shaped marshmallows. Candy Bucket Dirt Cup: Prepare 1 package of Healthsmart Chocolate Pudding mix. Top with 1 chopped Kit Kat mini. The post No Tricks Just Treats! appeared first on Nashua Nutrition Blog.